By default, the Maps app for iPhone will use voice navigation when giving directions. Voice navigation and talking directions is also the standard setting for Google Maps on iPhone too. But sometimes users can accidentally toggle the voice navigation settings off when they didn’t intend to, or forget to turn the voice navigation settings back on if they were disabled at some point. 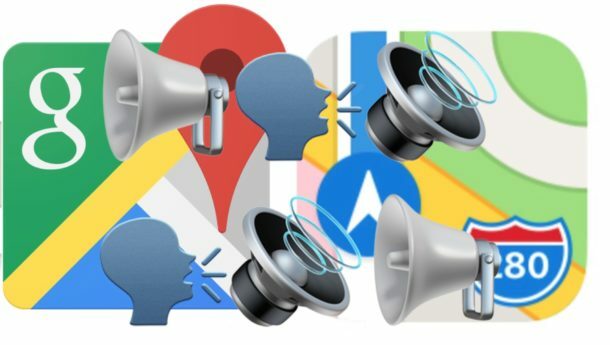 Not to worry, if you want spoken directions from your mapping applications then this article will show you how to enable (or re-enable) voice navigation directions for both the Apple Maps and Google Maps apps on iPhone. Wait: Turn Up iPhone volume! Before anything else, be sure you turn up the iPhone volume on your actual iPhone. Do this by pressing the physical Volume up button on the side of the iPhone repeatedly until the volume is set at maximum level as shown by the on-screen volume indicator. It’s fairly easy to inadvertently crank the volume all the way down using the physical buttons, and obviously if the device volume is off or down then the voice navigation will not be heard. So before anything else, just make sure the iPhone volume is up all the way and is working as expected. You’ll also want to make sure the iPhone does not have headphones or anything using the audio port plugged in. Another possibility is that the iPhone is stuck in Headphones mode, although that is fairly rare to occur, and if that happens then all audio won’t come through the normal iPhone speaker in general rather than just in the Maps applications. Now that you’re assured the iPhone has volume turned up all the way, you can turn to the specific Apple Maps and Google Maps apps to make sure audio is enabled in each of those too. The key thing with Apple Maps voice navigation settings is to make sure you don’t have “No Voice” set otherwise no matter how loud the volume is on your iPhone, you won’t have voice navigation available. These settings should apply through any directions given by the Apple Maps application, whether you are initiating them through the Apple Maps app directly or even if you’re starting by asking Siri to use voice navigation and turn-by-turn directions on the iPhone. Google Maps voice navigation settings can be toggled off or on directly within the Google Maps app while giving directions. The settings toggle makes it kind of easy to accidentally turn off or on the voice navigation for directions, so just be sure you have the setting properly enabled if you want to hear voice directions. As before, be sure you turn up the iPhone volume all the way first. 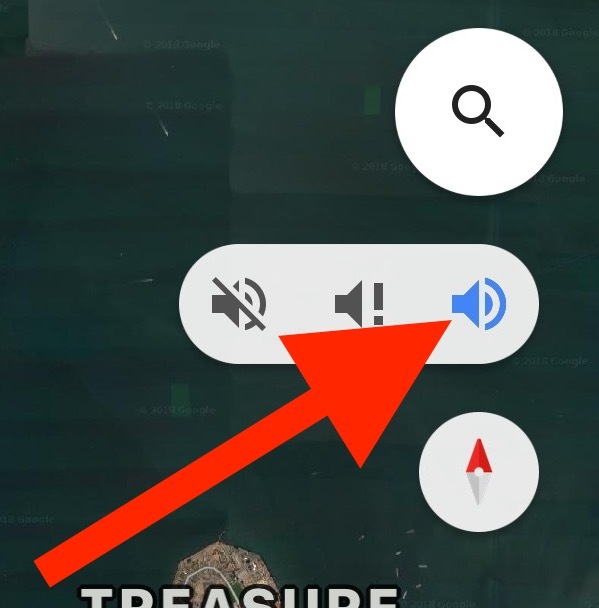 It’s pretty easy to mute and un-mute voice directions in Google Maps, which is nice if you’re trying to quietly get directions somewhere or you want to temporarily silence spoken navigation to a destination. But that can also mean it’s easy to accidentally toggle, since the audio navigation setting is just on the screen all the time. So just toggle the speaker button in Google Maps for iPhone and you’ll be able to get audio back again. That should be it, whether you’re using Google Maps or Apple Maps for directions, you now know how to enable or re-enable voice navigation in each app on your iPhone. Did this help you to get voice navigation and spoken directions working on your iPhone? Do you have another solution or trick for troubleshooting voice navigation not working on iPhone maps apps? Share your comments and experiences below! the voice in the map can be so useful. especially when we driving. thank you for this article . When I plug in phone to a USB port in the car there is no sound in turn by turn. As soon as I unplug the phone the sound returns. I want to be able to manually get turn-by-turn updates more often. Even better, by manually asking for them. How can I manually get turn-by-turn direction status? If I want more frequent verbal updates is there a way to manually get directional updates as of that moment? Turn by turn directions work on my iphone 5s until I start my car (2012 Toyota Rav4 with Bluetooth). Car started, no voice. So frustrated. Iv’e tried everything. I still can’t find any way to put navigation audio through the iPhone speaker. just rights and the Name of the Point. It’s just comfortable and simply to use, but when I‘ll visit my friends in Chicago I‘ll try to drive with 📱!